Need a go-to t-shirt to wear under your fancy black or blue blazer every date night? 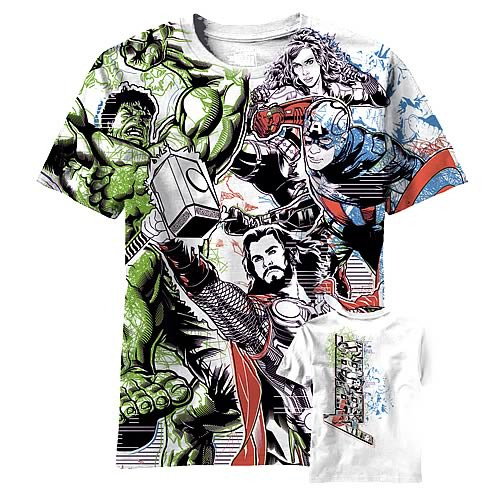 Look no further than this epically illustrated Avengers Able and Ready All Over Print T-Shirt! Why sully your reputation for class and sophistication with any regular old shirt or button down when you can be the epitome of haute couture wearing this bad boy? Just look at that powerful, masculine pose Thor is striking dead center between teammates Hulk and Captain America! Class up any joint, whether it's a four star restaurant or Mrs. Smith's fourth grade classroom, with this bold Avengers Able and Ready All Over Print T-Shirt!